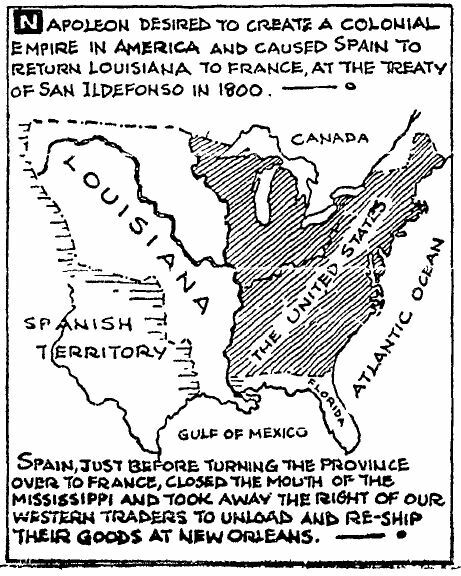 Image from Sons of the South. 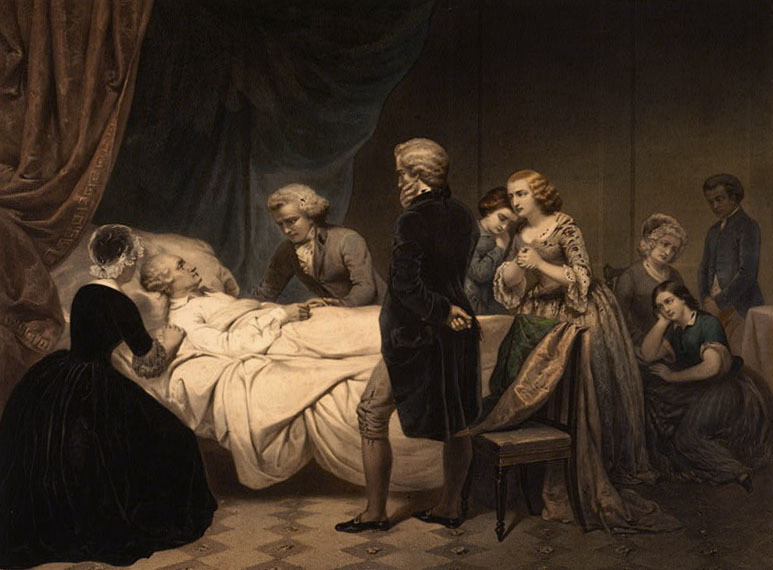 EXTRACT FROM A POEM ON THE DEATH OF GEN. WASHINGTON. Why strikes the bell a sad and mournful tone? From heaving breaths why bursts the struggling groan? Why weeps the Genius of our Western clime? Does aught portentious mark the present time? Fill every breast, and hence a world in tears. And shades with sable wing a foreign land. And plant his glories on the wreck of fame. And standards mourn beneath a foreign sky. And fly the daz’ling beauties of the Sun. 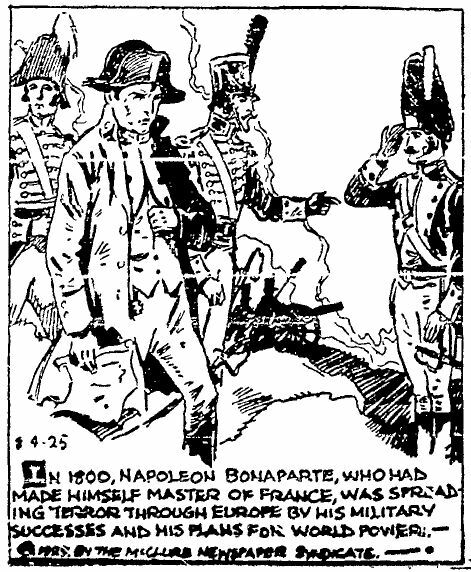 Napoleon Bonaparte spreading terror through Europe. 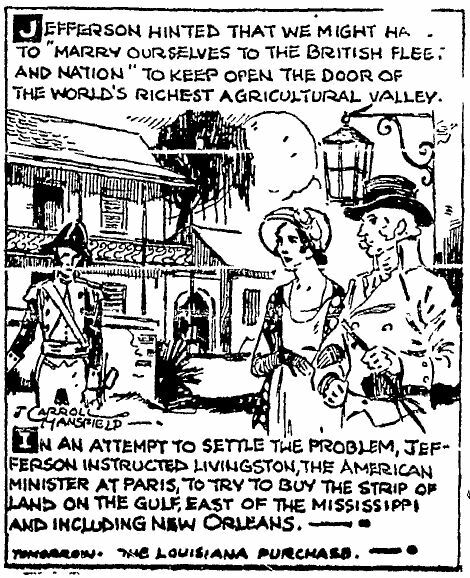 Napoleon desires colonial empire in America. 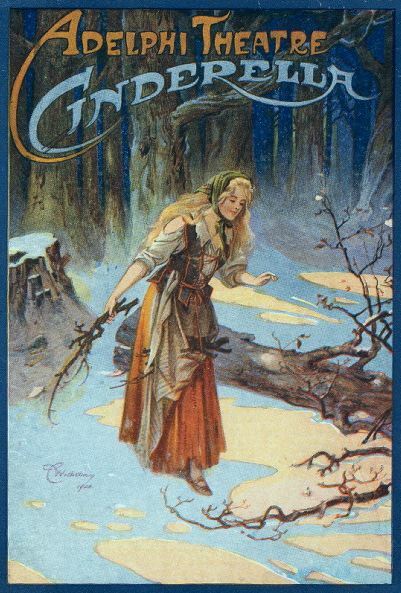 The origin of the tale from which this pantomime was adopted is sufficient curious. It was about the year 1870 that a French actor, of equal talent and wealth, named Thevenard, in passing through the streets of Paris, observed upon a cobler’s stall, the shoe of a female, which struck him by the remarkable smallness of its size. After admiring it for some time he returned to the house; but his thoughts reverted to the shoe with such intensity, that he reappeared at the stall the next day; but the cobler could give no other clue to the owner than that it had been left in his absence for the purpose of being repaired. Day after day did Thevenard return to his post to watch the reintegration of this slipper, which proceeded slowly; nor did the proprieter appear to claim it. 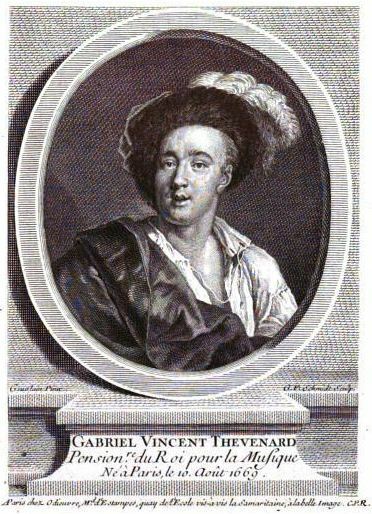 Although he had completed the sixtieth year of his ae, so extravagant became his passion for the unknown fair one, that he became (were it possible for a Frenchman at that day to be so) melancholy and miserable. His pain was, however, somewhat appeased by the avater of the little foot itself, appertaining to a pretty and youthful girl in the very humblest class of life. All distinctions were leveled at once by love. The actor sought the parents of the female, procured their consent to the match, and actually made her his wife. 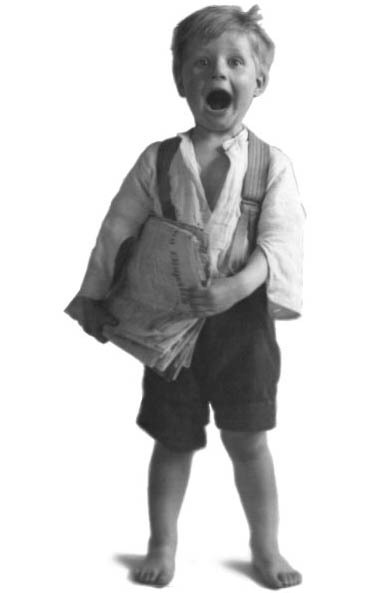 *Spelling differences/errors were in the original newspaper article. Title: The fascinating Duc de Richelieu, Louis Franqois Armand du Plessis (1696-1788). Living will be cheaper now! Sound the hewgag, beat the drum! Pullman prices have been cut! Meats are cheap in Panama! And put money in the bank. The cost of living has been rank. Isn’t it a wondrous change! Joyous news for every one! Salt’s dropped thirty cents a ton! NEW YORK – Sticker Shock The Fed may deny it, but Americans know that prices are rising. In this week’s Newsweek, Niall Ferguson takes a look at the Great Inflation of the 2010s. I respect Bernanke. As an expert on the financial history of the 1930s, he was one of the very few people in power back in 2008 who grasped how close we were to another Great Depression. But if we’ve avoided rerunning the 1930s only to end up with a repeat of the 1970s, the public will judge him to have failed…. …maybe inflation expectations started shifting when the guy from Goldman—a Marie Antoinette for our times—seemed to say: let them eat iPads! 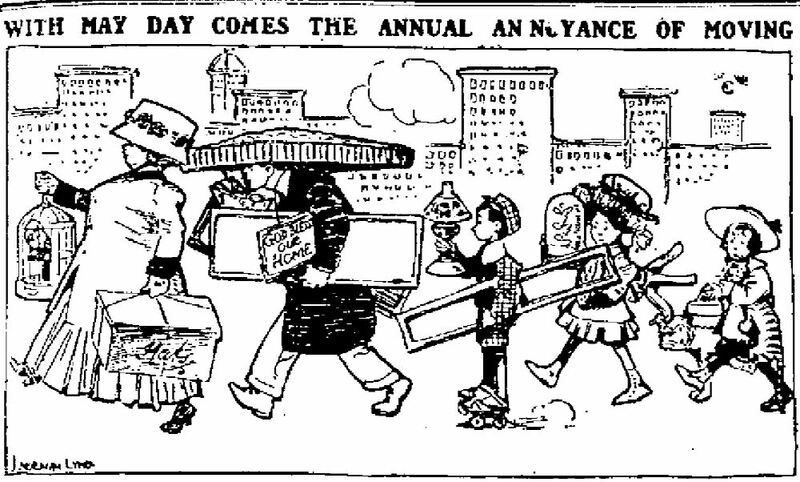 With May Day comes the annual moving proposition. It carries with it the usual annoyance of shifting your abode, for what would the first day of May come to if we didn’t continue the practice of moving? Beautiful May, all except the inconvenience of moving – a custom that won’t live down. CHICAGO, May 24. — May Day moving here set a new record for the period of the housing shortage, according to the requests for changes to telephone and gas companies. More than 3,000 changes daily were asked of a gaslight and coke company before the yearly exodus to new homes. This is 50 per cent higher than 1921. J.S. Waterfield, Chicago Real Estate board said the “own your own home” idea is responsible for hundreds of the movings. CHICAGO, May 1. 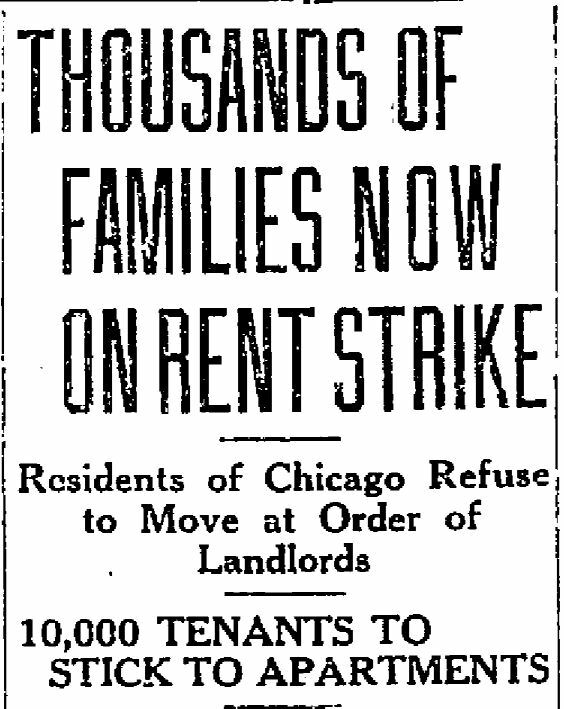 — Thousands of families in Chicago went on a “rent strike” today and refused to vacate their apartments in accordance with May Day moving orders, H.S. Standish, president of the Chicago Tennants’ Protective League, asserted. Mr. Standish predicted that 10,000 tenants would defy efforts of landlords to evict them. 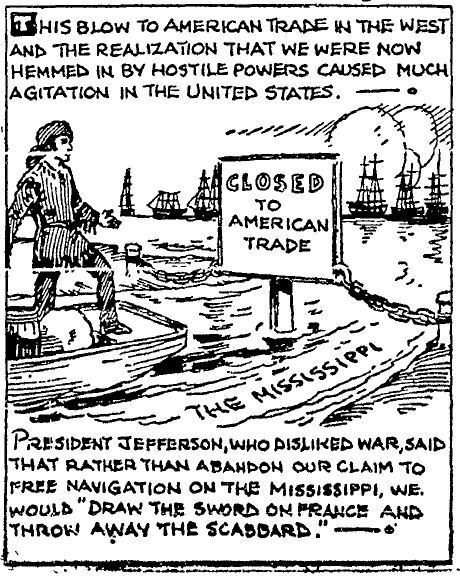 Some of the disputes would be settled by arbitration, Mr. Standish said, but others would be carried into court for jury trials. NEW YORK, May 1. Two men are largely responsible for starting in this state the anti-rent profiteering crusade which, unless the laws are finally thrown out by the courts, has limited landlords to 25 per cent increases. One of them is not even a New Yorker. His name is James F. Gannon, Jr., and he is city commissioner of Jersey City. The other no longer hold any official post. His name is Nathan Hirsch and he was formerly chairman of the Mayor’s Committee on Rent Profiteering. It was Hirsch’s committee — and largely Hirsch himself — who first came to the aid of the victims or rent profiteers. Before this persons who objected to extortionate rent increases were called “Bolsheviki.” Hirsch had little real authority, but he used what he had with good effect. The result was that any number of cases were compromised last year by the landlords, and tenants were enable to stay on by paying only moderate increases in rent. A strong public sentiment was built up to oppose rent hogs. Hirsch was serving without pay and when the appropriation he asked to continue the committee’s work was refused he resigned. Then came Gannon. Early this year he engineered the biggest rent strike ever conducted and won it. Thousands of tenants with the city’s backing, refused to pay unreasonable rent increases and won in the courts. This woke New York up. If Jersey City can do it, why can’t we? was the comment. The result was a wave of popular sentiment that swept everything before it and resulted in the enactment by the Legislature of a dozen laws to protect the tenant, the most important of which is the measure limiting rent increases to 25 per cent. 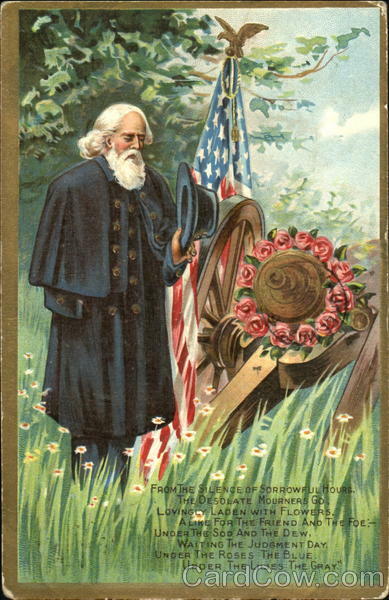 The month of May, when poets sing of roses and meadows decked with green, is, in the vicinity of New York, the flitting time for half the world — or has been. Fortunes are changing and even the May moving day, so long sacred to New Yorkers, is giving way before the iconoclastic spirit of the age. Enough, and more than enough of it, is left however. The removals of the great annual flitting time, often useless, often undertaken without clear reason than that restlessness so peculiar to American life, must cost the people of New York, Brooklyn and Jersey City, directly and indirectly, not less than $3,000,000 in actual money outlay, to say nothing of personal discomfort. Moving time entails an endless train f discomforts and disorders. It means a clear month’s comfort gone out of the year in preparing for the move and getting over it; is the direct cause of broken furniture not a little, of wrecked tempers by the thousands and of much actual suffering. But moving day is not what it used to be. People who move in spring are beginning to discount it by removing at any time during the latter part of April, so that the first of May no longer resembles the fag end of a furniture dealer’s nightmare so much as it did. The real estate agents, too, have conspired against moving day. Not that the agents want people to stay where they are and forswear change. By no means. The more removals the more commissions for the agents. It is to increase their own profits and those of the owners that such strenuous efforts have been made, and with much success, to substitute October for May as the moving time. Many landlords now let houses from October to October, and more are anxious to do so. 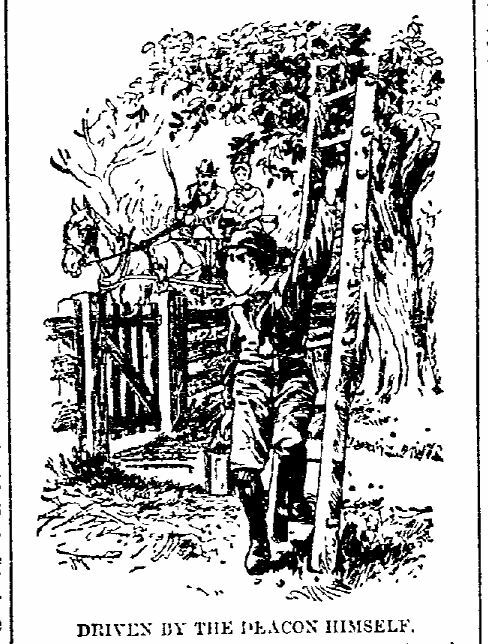 The reason is that a good many people of moderate means, whose only hope of getting wives and babies into the country for the summer is to stop paying rent, and have been in the habit of giving up their houses on May 1, storing the furniture, packing off the family and seeking board until October, when the city residence could be safely resumed in another quarter. This arrangement was fine for the tenants, but it was bad for the owners and agents, consequently it had to be stopped. And it is being stopped. The following unjustifiable case of landlord oppression is one of the many cases which May day moving has developed in Jersey City: — A widow named Jane Meara, with her five children, occupied a small store in Prospect street, near Morgan. The property changed hands, and as a consequence the widow was doomed; but her lease had not expired and she held a receipt for the rent of the premises, paid in advance, for the month of May. 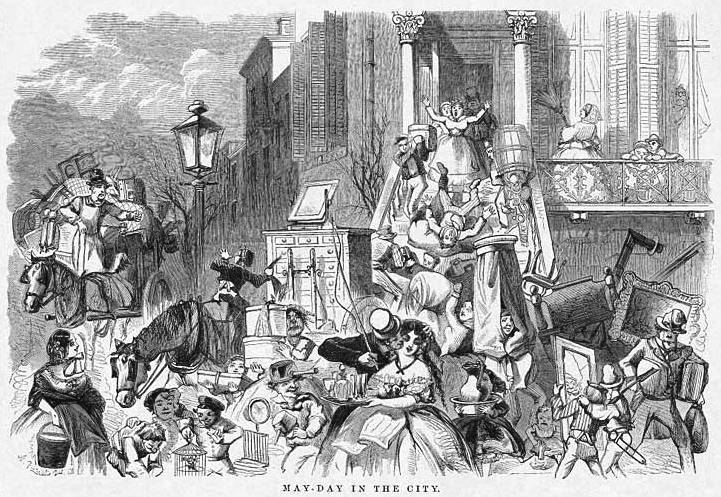 Under these circumstances the poor woman felt secure, at least for the present; but on May day, during her absence, her furniture and goods were thrown out of doors, and when she returned to her house she found the premises so locked and fastened that ingress was impossible, while every article of her household goods was drenched with rain on the sidewalk. She at once proceeded to Justice McAnally, who very humanely allowed her the use of a house for herself and her children till she can procure other quarters, as this was the only relief he could afford in the case. The woman has commenced a suit against the new proprietor, laying damages at $10,000. First of May — Moving Day. There was not as much moving yesterday as is common upon the last of April — pretty good evidence that landlords generally were wise enough to fall somewhat from their old rates of rent, and so far accommodate tenants that they could afford to keep their old premises another year. Whoever is abroad to day, however, will be disposed to think there never was so much moving before. It will begin early — before some of us are up, no doubt, and it will continue late. The sidewalks will be worse obstructed in every street than Wall-street is where the Brokers are in full blast. Old beds and ricketty bedstands, handsome pianos and kitchen furniture, will be chaotically huddled together. Everything will be in a muddle. Everybody in a hurry, smashing mirrors in his haste, and carefully guarding boot boxes from harm. Sofas that go out sound will go in maimed, tables that enjoyed castors will scratch along and “tip” on one less than its complement. Bed-screws will be lost in the confusion, and many a good piece of furniture badly bruised in consequence. Family pictures will be sadly marred, and the china will be a broken set before night, in many a house. All houses will be dirty — never so dirty — into which people move, and the dirt of the old will seem enviable beside the cleanliness of the new. The old people will in their hearts murmur at these moving dispensations. the younger people, though aching in every bone, and “tired to death,” will relish the change, and think the new closets more roomy and more nice, and delight themselves fancying how this piece of furniture will look here and that piece in the other corner. The still “younger ones” will still more enjoy it. Into the cellar and upon the roof, into the rat-holes and on the yard fence, into each room and prying into every cupboard, they will make reprisals of many things “worth saving,” and mark the day white in their calendar, as little less to be longed for in the return than Fourth of July itself. Keep your tempers, good people. Don’t growl at the carmen nor haggle over the price charged. When the scratched furniture comes in don’t believe it is utterly ruined, — a few nails, a little glue, a piece of putty, and a pint of varnish will rejuvenate many articles that will grow very old ‘twixt morning and night, and undo much of the mischief that comes of moving, and which at first sight seems irreparable. 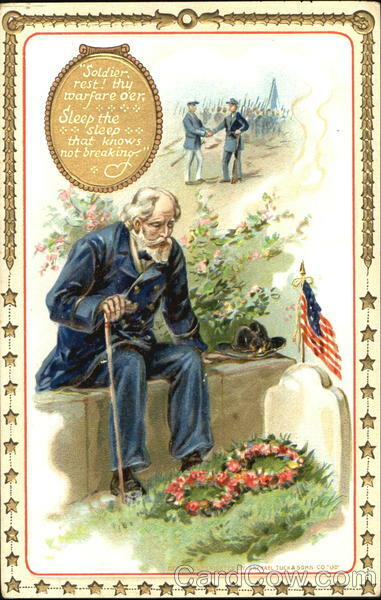 At night, after you have kindled a fire in the grate, — don’t, because you have cleaned house, make your house a tomb for dampness, nor let the children shiver through the evening, — after the tea things have been set aside, be sure to take one peep of the moon in her eclipse. Nor stay too long to look at her, for her exhibition begins rather late, and you should be up early next day to tack down the carpets, set the furniture to rights and make a home of your new house. Moreover, if it rains or is very cloudy, take our advice and don’t look at the eclipse — it’s no great affair after all. The prospective May Queen said. May 1, 1589 — Queen Elizabeth is Queen of May, catches cold, and has the snuffles all day. May 1, 1755 — Moving day, Dr. Johnson evicted for non-payment of rent. Dramatic Author — I understand that you are looking for a new play. Manager — Yes, but I am very hard to suit. I want a play which shall combine all the elements of tragedy, comedy, farce, pantomime and spectacle. 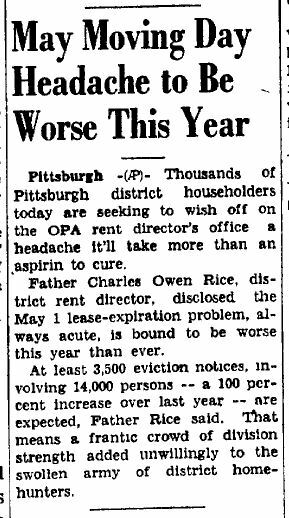 I thought the May Day moving had petered out in the 1920s, but evidently it was still going strong in Pennsylvania as late as the 1940s!